But should a closer look be necessary, unique de-icing and lightning protection capabilities allow Triton to plunge through the clouds to get a closer view and automatically classify ships. And in recent tests, the drone was able to easily recover from perturbations in its flight path caused by turbulence. 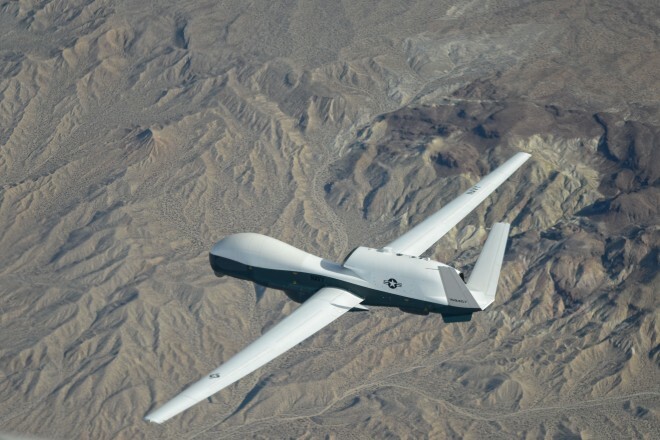 Although Triton has a higher degree of autonomy than the most autonomous drones, operators on the ground will be able to obtain high-resolution imagery, use radar for target detection and provide information-sharing capabilities to other military units. Northrop Grumman reported earlier that Triton had demonstrated structural strength of the drone’s wing — a key capability that will allow the aircraft to descend from high altitudes to make positive identification of targets during surveillance missions — even when it was subjected to a load at 22 percent above the Navy’s requirement. Under an initial contract of $1.16 billion in 2008, the Navy has ordered 68 of the MQ-4C Triton drones with expected delivery in 2017 — a slip from the initial anticipated date of December 2015.